Hops are strange beasts. More than mere flower, they have the power to transfix grown men with their chameleon charms. Bitter or sweet, floral or spicy, vicious or gentle--pick your poison. Until the fresh hop phenomenon picked up steam in the last few years, I thought I understood this spice. But the palate of flavors produced by a wet hop are uncharted. Last night, as I was trying to describe an elusive flavor to Sally, I couldn't locate it. I am reminded each time I inhale the scent of a fresh-hopped beer that there is more to this herb than just alpha acids. Hops are enormously complex, and based on the evidence of my nose and tongue, the chemistry is scrambled depending on how much life courses through the cone when they enter the brew kettle. Hops are native to temperate climates and were found in North America, Europe, and Asia. 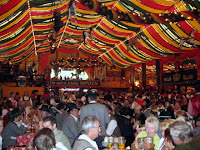 The first hops were cultivated domestically in Germany in the 8th century near Hallertau. In the 9th-12th centuries, hop cultivation started in Bohemia, Slovenia, and Bavaria. Europeans pretty much instantly discovered hops when they arrived in America. Records show that the Dutch were growing hops and brewing on Manhattan Island in 1612. It's not clear where the hops came from, but those settlers describe good, wild hops growing on the island. In colonial times, hops were grown throughout the Northeast, but particularly in Massachussets; by the mid-19th century, major production had shifted to Wisconsin, where beer-brewing German residents settled. Unfortunately for the Badger state, aphids and powdery mildew wiped out the Wisconsin fields, and the West Coast picked up the slack. Now, all commercial hops come from the Northwest, 70% from the Yakima Valley. Alpha acids. These are one of two major compounds of the soft resin that turn a beer bitter when "isomerized" (eg, boiled in beer). Beta acids. Another compound of the soft resin that contribute aroma, beta acids are added for aroma. Their aromatic properties are destroyed by boiling, so aroma hops are added at the end of the boil. Co-humulone. Alpha acids exist in three "analogous forms," humulone, ad-humulone, and co-humulone. Co-humulone accounts for 16-50% of the alpha acids in a hop plant, and they are suspected of contributing a harsh bitterness. This hasn't been proven. Lupulin. This is the yellow pollen-like powder on hops. High-alpha hops have more lupulin, but it's not clear what they contribute to beer. Oils. These are more subtle contributors to aroma and bitterness. The oil content of 100 grams of hops ranges from .5 mls to 3 mls. The four main components in the oils are Caryophyllene, Farnesene, Humulene, Myrcene, though the percentage of each within a hop variety varies dramatically. They are volatile hydrocarbons and driven off during the boil. Sources: Hopsteiner, Hop Union, Oregon State University, Yakima Chief. This weekend, the series of fresh hop "tastivals" kicks off in Hood River. I missed these last year, so I can't speak from personal experience--but they look cool. Roughly two dozen breweries with at least one fresh-hopped beer, many with more than one. Food, Columbia Gorge wines, and craft vendors. The event is situated in downtown Hood River between 5th and 7th streets and Cascade and Columbia streets. Admission to the grounds is free. To taste beers, visitors must buy a 14-ounce commemorative tasting mug for $5, and taste-tokens -- $1 for a 3-ounce taste, $4 for a fill. Food and crafts vendors also set prices separately. Noon - 9pm. Oct. 18 – Hopworks Urban Brewery, Portland , Noon – 9 p.m.
Oct. 25 – Ninkasi Brewing Company, Eugene, Noon – 9 p.m.
Incidentally, I did make it to Belmont Station last night, and I'll have my thoughts on fresh-hop beers from Ninkasi, Double Mountain, Full Sail, and Hopworks later. If you go (I may not make it tonight), let me know what you think. One commenter has already said Pelican's Elemental Ale is a winner. Others you'd recommend? Stock markets plunged as it appeared that the measure would go down to defeat, and kept slumping into the afternoon when that appearance became a reality. By late afternoon the Dow industrials had fallen more than 5 percent, and other indexes even more sharply. Oil prices fell steeply on fears of a global recession; investors bid up prices of Treasury securities and gold in a flight to safety. Hammerhead Pale Ale, Terminator Stout, Nebraska Bitter: There's plenty of beer varieties being made at the McMenamins brewery in Corvallis. But the company's famous Ruby beer, created in 1985, isn't among them. The raspberry-flavored beer hasn't been part of the plan for a few weeks now. That's because of raspberry crop failures -- first in the Northwest, then worldwide. "The number one raspberry producing country in the world is Serbia," said McMenamins brewery manager Rob Vallance. "And they had a horrible, horrible crop as well." It seems awfully major for me to have totally missed it. (Though that wouldn't be unprecedented. Ah, fall, the time when the serious beers come out. (Sort of like the movie calender, no?) In particular, it's fresh hop time. The harvest is in, the beers have been brewed, and now they're starting to pop up around town. Here's a brief run-down. Available: Already released in bottles and on tap. Info from the 2007 version--I'll update it if the recipe has changed. Others with fresh hop ales (but no info! 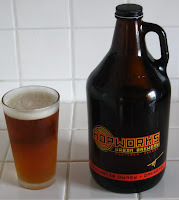 ): Hopworks Vienna, Ninkasi. I found a photo set on Flickr by "Zurika" with nice photos, if you want to have a peek. I will steal one as bait. Update: I should have mentioned two stats over which the OBF has dominance. Arguably, they're the whole ball game. Someone just tipped me off to this interview with Russian River brewer Vinnie Cilurzo. It starts out with fairly fluffy content, but then there's a passage about how a commercial brewery must handle brettanomyces yeast and what the costs are to hand-craft barrel-aged beer. It's worth reprinting, if only underscore Russian River's commitment to good beer. This brewery is not that large. How do you keep the yeast from spreading into the other beers? We keep two of everything, if not more. And what I mean by that is, we have a separate pump just for the funky beers. Different hoses, different valves, different gaskets for hoses and doors, and even the rubber gloves we use for cleaning and handling. And we keep the barrels of aged beer in a separate room. How did you first decide to start experimenting with aging beers like wine, in barrels? The first beer we made with Brett, Temptation, was also our first aged beer. It was made in 1999 and released in 2000. It’s a blond ale aged in Chardonnay barrels. You don’t have to ferment in barrels if you use Brett; you can do it in stainless steel. 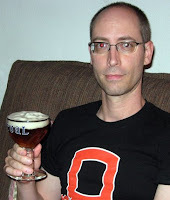 In fact, my very, very favorite beer, [the Belgian] Orval, is made that way. But I wanted to put Temptation in wood, because Brett is a yeast that’s so strong, it just wants to keep on eating. If it runs out of sugars in the beer to keep eating, it won’t die. It’s almost impossible to kill. But if you give it a place to live in the porousness of the barrel, it can keep eating the sugars in the wood, and keep kicking out all these interesting flavors while it’s doing it. How long do you age your beers? Consecration is aged 6 to 9 months, Temptation 9 to 15 months, Supplication 12 to 18 months. The average brewery is on a 24- to 25-day cycle. It’s a pretty big financial hardship for us to make beer this way. Our biggest-selling beer, accounting for over 50 percent of our sales, is the [unaged Double IPA] Pliny the Elder. We could make a lot more [unaged] beer in here if we didn’t commit this much space to funky beers, but that’s my passion. I stopped in at Belmont Station last night and had a pint of Southern Oregon Brewing's Porter. If you recall, this is the Medford brewery that opened late last year (nice article here). For those of us at points North, it is an obscure place. No presence on the web, and until I spied this beer, no distribution in Portland. And yet by all accounts, it's a fairly big brewery, so I've been hoping to see it eventually. German schwarzbier. Quite a nice beer, comforting and quaffable. I could probably use another pint to get a stronger bead on the beer, but it's in the B to B+ range. Nice. Incidentally, Sally had a Swibrau Oktoberfest (presumably named for Matt Swihart, co-owner/brewer). I stole a swig or two and found it to be wonderfully spicy and rich, and I regretted I didn't have a pint of that, too. Something to put on the list. 1. It's not a bad opportunity to buy a sixer and throw it in the basement. Even if you don't want to age it for years, by the time the weather turns chill (forecast for the weekend--85), that winter ale will have lost its rough edges so as to be perfectly smooth and comforting. Of course, you could buy an extra sixer and save that for a year. 2. This year's label ain't bad. After last year's (mmm, how to say?) colorful edition, I find this one welcoming and seasonally-appropriate. Jon points out that this is the 21st bottling of Jubel (it was the first beer Deschutes bottled), which makes this particular label more than the usual keepsake. For no other reason than I found them on line, I will also include a few other of the past Jubel labels below the jump. They had a good run from 1998-2000, didn't they? Over the weekend, I had occasion to crack open one of the few remaining bottles I have brewed the long-defunct Saxer Brewery. Back in 1998, when it was teetering on the brink of bankruptcy, I had the foresight to buy a sixer each of their flagship Bock, Dark Bock, and the legendary Three-Finger Jack Doppelbock. I have a friend who turned forty on the 20th, and so I dug into the larder to pull out the dusty gem. It takes a milestone like that. Before I rave about the beer, let me again make a pitch for the beer cellar. If you've got a basement, it's easy to pull off. Beer's cheap. The Saxer I bought cost less than 20 bucks back in '98--and now I'm sure I could easily find a buyer who'd pay twice that for a single bottle. This is partly because the brewery is now defunct: Tony Gomes, the German-trained brewer, was hand-crafting among the most celebrated lagers in America (the bock won gold at GABF three years running), and we'll never taste these beers again. But also, any high-gravity beer is worth more a few years down the road than it is when you pull it off the grocery shelf. They don't always taste better--aging is an imprecise science--but when they do ... wow. The nice thing is that it costs very little to get started. Go to the store, buy a case of assorted beer, put 'em in the basement and forget about them. Repeat each year. Before you know it, you're hauling out a bottle that's ten years old. Okay, off my soapbox. So, to the bock. Gomes brewed this beer like it was 1873--which is to say, expensively. He used a decoction mash and aged it for--well, memory doesn't serve too well. But he left it in the tank long enough to knit owner Steve Goebel's brow. As a slight sop to the local market, Gomes over-hopped it to maybe 35 IBUs (marginally, but for a German brewer, it was enough to cause his brow to knit). The resulting beer, as I recall, was extremely smooth and rich, with just enough spice to make it inviting for my IPA-lovin' palate. BridgePort's Hop Harvest is one of the first fresh-hop ales to hit the market, and I had the opportunity to try a pint last night. A year ago, I considered this beer one of the "winners" of the fresh-hop crop, and it has lost nothing in year two. It's brewed with Centennials (a high-alpha Cascade), weighs in at 7% by volume, and is purported to have 70 IBUs. But these details are misleading because with fresh hop ales, everything's different. I tried it both on cask and regular draft, and this was an instructive experiment. Cask reveals the herbal quality--I get a lemongrass note and some savory herbal touches (rosemary, basil?). I say lemongrass to suggest that the citrus note isn't straightforward; it's herbal rather than fruity. The malt is softened on cask, and it tastes nothing like a burly 7% beer. As for the IBUs, I've no doubt they're there, but this beer isn't bitter. On regular draft, it's not nearly as tasty. The richness of the hops are subdued (everything is just less intense), yet there are some sharp, almost grinding notes that are absent in the cask version. I highly recommend trying this at the pub where it's on cask (I was at the Hawthorne pub) to taste the qualities of the wet hops. New York, September 16, 2008 – Orkney-based Distiller of the Year, Highland Park, today releases a new, permanent flagship 40 Year Old expression in the U.S., adding even more allure and acclaim to the distillery’s highly awarded array of single malt Scotch whisky expressions. 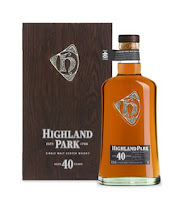 Matured primarily in previously-filled sherry oak casks, Highland Park 40 Year Old is a harmonious masterpiece. The extended time that the spirit matures in previously-filled sherry oak casks is evidenced by the classically composed and perfectly balanced Scotch whisky Highland Park 40 Year Old. The delicate coppery paleness of the whisky is entirely natural -- true to all bottlings of Highland Park -- and in this case also a result of the judicious use of refill casks. If first fill casks had been used for such a lengthy maturation, the sweetness (an oak-derived additive quality from the cask) would have been too strident. Highland Park 40 year old has therefore been largely matured in refill casks, that is to say casks that have previously been used to mature whisky. Every time a cask is used, its ability to impart an influence on the spirit is diminished. When laying down a whisky for extended maturation, such as this, it is important that the cask doesn't dominate the spirit. The long-term nature of the maturation of Highland Park 40 year old allows time for the perfect balance to be achieved. The only problem I can see: "Highland Park 40 Year Old is available in key markets with a suggested retail price of $2,000." Nevertheless, I let Sally, the woman who sent the press release, know that I'd be willing to give it a shot if she sent me a sample bottle. Still waiting on a reply. It all started with some unhappy Bavarians. Dissatisfied with the quality of beer brewed in the summer months, they forbade brewing the beverage when the weather was warm. However, colder winter temperatures inhibited fermentation by the ale yeast that had been used for hundreds of years and fostered an unlikely pairing with a second, heartier species-producing an unusual crisp, clear brew that became today's lager. Sherlock, an assistant professor of genetics, and Barbara Dunn, PhD, a senior research associate at the medical school, studied the genetic sequences of 17 unique lager yeast strains from breweries in Europe and the United States. They used customized DNA microarrays capable of analyzing the relative contribution of each parent, combined with limited DNA sequencing, to determine that the hybridization event actually occurred not once, as previously speculated, but twice. This genetic encore suggests that each partner brought specific, unique advantages to the match. "It's possible that the ale strain provides a certain flavor profile, while the second strain conferred the ability to ferment at cooler temperatures," said Dunn. "Mixing them together is a nice way for the yeast to double its genetic options...."
As often happens, the offspring of such an unconventional union exhibited abnormal amounts of genetic material. Sherlock and Dunn believe that one lineage began with approximately equal amounts of each yeast's genome, whereas the other has between two to three more times S. cerevisiae than S. bayanus DNA. Studying the spread of the two groups provides a genetic snapshot of lager brewing in Europe during the past 600 years: one lineage is associated primarily with Carlsberg breweries in Denmark and others in what is now Czechoslovakia, while the other group localizes to breweries in the Netherlands, including Heineken. My lovely and talented wife was walking in to work today and encountered a man cutting down hop vines. Her first thought was that he was maybe going to toss them (some people do grow them ornamentally). Nope--he was headed to the Lucky Lab with them. He had "three or four" varieties, and he's long forgotten what the were or which is which. But he did know that the Lab will be making a fresh hop beer called The Mutt, and he was prepping his contribution. Quite a scene. Sally says the result of his labor lay on the sidewalk in a pile ("tall as a haystack"), hop cones still attached to the vines. He plans to drop them off, knowing that there's a hop shortage, always willing to help. Now, normally I'd assume the brewery would thank him and toss these in a compost bin, but maybe not. It is The Mutt, and this is the Lab, and so maybe they'll pass vines out to patrons on the back porch to harvest. They'd do it, you know. Update: Yep, tonight was the night. 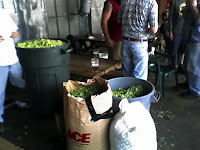 They got 75 pounds of hops last year, and 125 this year. Pics from the night. This guy handed us a nice sprig of hops (which you can see in the foreground), thus the name. Update 9/18: Bill, who's apparently in the pic above, has a write up and far better pictures than these here (from my cell phone) over at It's Pub Night. The final entrant to my Trappist Ales round-up is my favorite, the legendary Orval. Unlike the other Trappist breweries, the monks of Abbaye Notre-Dame d'Orval do not brew a range. Instead, they produce a single beer, one that doesn't conform to any extant style. It is simply Orval. But what is Orval? Is it the green, lively beer they first bottle, sticky with hop resins? Or is it the older beer, pulled from cellar shelves after a year or two of aging? This ale is austere--bone dry and tart, a meditative beer for a quiet evening. The monks have brewed a singular ale, but the essence of Orval is its mutability. Paradoxically, even a single bottle contains many beers. I consider Orval one of the finest beers in the world, and by that, I mean I love them all. On the label you will find the picture of a fish with what turns out to be, on closer inspection, a golden ring. The legend behind the depiction is this: before there was monastery at the site, Countess Mathilda of Lower Lorraine was sitting at a spring there. This is a monastery founded on legend. Is it any wonder they've made a legendary beer? The Abbaye Notre-Dame d'Orval is located on the border with France in the Southern tip of Belgium. The first monks arrived from Italy in 1070, but the site was never occupied and was actually abandoned for a period. Monks returned and completed the monastery in 1124. The monastery suffered the same trials as others in Europe--fire and wars plagued it, and it was abandoned as a consequence of the French revolution in 1793. Monks rebuilt Orval beginning in the 1920s, and they established a brewery there in 1931. (This shows the monks fine set of priorities: the monastery was not completed and consecrated until 1948.) Although the current brewery only dates back 77 years, records show that brewing was a part of monastery life centuries ago. The monastery at Orval is modern, but the monks trace their history back so far that it fades into myth. This can also be said for the beer they make, a modern product which nonetheless might have been brewed at the site five hundred years ago. 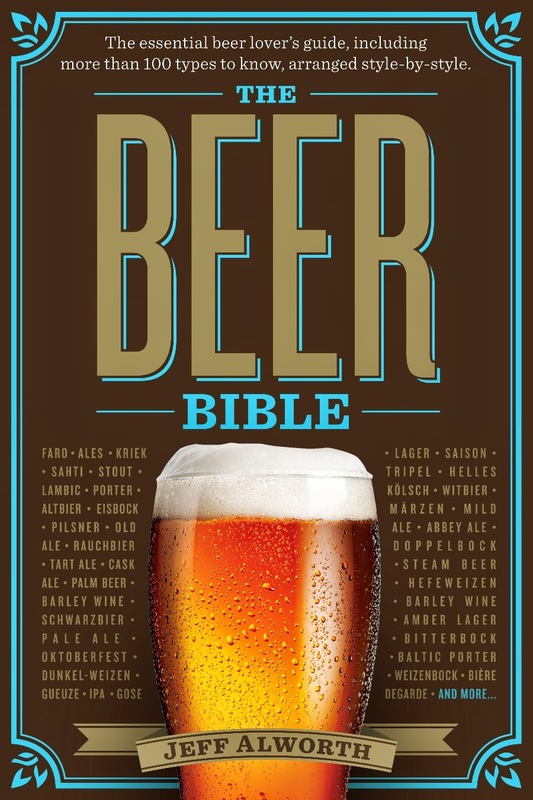 The current recipe was created in the 1930s, a product of the work of the first brewer, a Bavarian named Martin Pappenheimer and John Van Huele, a local Belgian brewer. Both emphasized hops, which characterize Orval to this day. The brewery is very hands-on. The monks have the barley malted to their own specifications, inspecting each season's harvest and adjusting the recipe to make sure it retains its characteristic orange color. They also make their own candi sugar, letting it crystalize on strings "like cracked ice" (Jackson). They hop the beer with whole-flower Styrian Goldings and Hallertau- Hersbrucker. The element that most distinguishes Orval, however, is the yeast. A single ale strain is used in primary fermentation, a process done traditionally in open vats. It is then given a secondary fermentation in closed cylinders using a complex blend of ten strains that includes brettanomyces. The flavor of the beer isn't funky, though--brett is a minor organism in the ecosystem of Orval. During this phase of fermentation, the beer is dry-hopped, as Van Huele first suggested (unique among the Trappist beers). The monks don't filter Orval at bottling, and the elixir is left to ferment a third time in the bottle for another eight weeks. Thanks to the continuous action of the yeasts (those brettanomyces are able to continue to find nutrition among sugars ignored by less hardy strains), the beer will continue to get more alcoholic in the bottle. The beer is listed variously at 6.2% to 6.9%, but these are averages. At bottling, it's only 5.2%, but later vintages have been measured at 7.2% and up. The flavor is likewise dependent on the age of the beer. Newer vintages are redolent of the fresh hops; the body is fuller. As the beer ages, it dries and starts to sport the tartness of wild-yeast character. Connoisseurs have settled on ages they like the best. For me, they're all wonderful in their own ways. I have had a couple of Orvals recently.In the picture at right, I'm enjoying a year-plus vintage. By way of comparison, I've also cracked a bottle that had just arrived in stores (though it was already older, at six months, than almost any beer you can buy in the US). Let's start with the younger bottle. Although it's not obvious from the picture, the beer is a burnt orange color. The head, unlike the whipped cream-like structure of the older bottle, was much softer and denser--snowy. The young version has a quality of youth--it's vibrant and boistrous. The hops really pop, and it has a Northwesty hop signature (no doubt such a beer would be pooh-poohed as inauthentic were it to hail from here). It's one of the more aggressively hoppy Belgians you can find, leaving a resinous, lip-smacking aftertaste. The yeast has not yet achieved the complexity of character it will develop--you get a slightly astringent quality in what is an otherwise fairly wet beer. No great alcohol note--it's quite approachable (though warmth appears, as if by magic, in the belly). The result is something like a cross between a hoppy pale ale and an abbey ale, sort of. Fast forward another year and the beer is far less hoppy. A lemon zest note is pronounced in both the nose and palate. Hops are evident, but you might miss them because the yeast character is now coming through. The beer is much drier, not quite tart, but in possession of brett-y astringency. It actually tastes old, like you imagine some mythical old amontillado should be. The alcohol is much more obvious; it's hard to believe this is the same beer as the younger version. Although you sacrifice the hops for the older version, you get something more soulful, like an older singer whose range has been replaced by life and character. To me, Orval at any age could be considered a top ten world classic, but I like the elder version: the alcohol and the dryness, they comfort me. 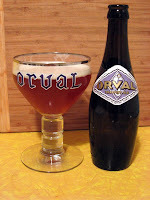 Availability: For one of the world's precious gems, Orval is suprisingly widely available. All beer stores should carry it, and I've seen it in a number of grocery stores. When I was a kid growing up in Boise, Idaho, we used to drive through hop fields near Parma on the way to my grandparents' house near Ontario. The entire Treasure Valley is agricultural, but there was something quite striking about the hop fields. So tall were the vines that it was like driving into a small forest. Perhaps it was the way my dad used to admire them, suggesting something mature--almost illicit--about their role in his fave beverage that originally primed me to become a beerhound. Hop harvesting is slightly more mechanized than it used to be--workers no longer haul the vines down and pick the cones by hand. (If you've done that with home-grown hops, you know that it's a sticky, hand-roughening experience.) But it's still pretty elemental. I'll put a nice video below that shows the process. Toward the end, you'll see the drying room. What they don't describe is the feeling of this place, which is worth mentioning. It's very hot there, and as the hops dry, they turn the room into a sauna. And the aroma! The heat and humidity lift some of the resinious tastiness into the air; when hopheads breathe this in, they almost begin to vibrate with a contact high. Also of note, the fresh hop ales are arriving. 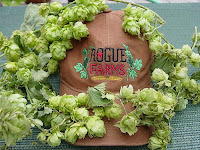 BridgePort Hop Harvest and Full Sail Lupulin are out (Bill has reviews). Laurelwood's was brewed a week ago and will be available 9/22. I know that the Lab is doing another round of the Mutt, and Lompoc has got something cookin' too. Also, next month there will be another round of Tastivals--fresh hop festivals on three weekends at different places around the state. I'll give you more details on those when it gets closer. 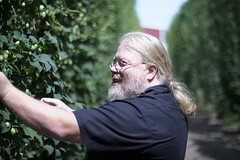 Also, some nice photos of John Harris's recent trip to the hop fields. Program note: working on the final (and long) review of trappist ales. Next up: Orval. As a follow-up to the post below about the dying English pubs, it's worth expanding on a point Joe made in comments. English pubs compete in a dramatically different regulatory environment than those in the US. Our system, as you know, ensures that pubs are wholly independent--US law mandates that a distributor act as a middle-man between the brewery and the pub. These rules were created as a protection against the English system, where breweries directly owned pubs--a system known as "tied house." That system is still in place, and it may be a major reason pubs are in trouble. Beer sales are dropping precipitously in the UK--down 22% since 1979. The largest drop is among the "premium lager" segment. Sound familiar? (Cause and effect are not easy to tease apart here. Some blame the drop-off in pub sales as the cause, and cite a recent smoking ban and the rise in prices. But that isn't convincing, either--sales have been dropping for at least a decade. Long before last year's smoking ban and recent spike in taxes on draft pints.) But what to make of the simultaneous, contrasting trend of the boom in English craft breweries, who saw sales increase 11% last year? "Brewers are protected from competition in supplying their managed and tenanted estates because other brewers do not have access to them. Even in the free trade many brewers prefer to compete by offering low-interest loans, which then tie the outlet to them, rather than by offering beer at lower prices. Wholesale prices are higher than they would be in the absence of the tie. This inevitably feeds through into high retail prices." I am, as you all know, both a foe of the power of US distributors as well as a pinko commie. I am therefore leery of blind boosterism of free markets. In this case, it seems like a no-brainer, however. As long as the UK keeps the tied-house system in place, the market is going to suffer a more violent reckoning as a result of changing consumer tastes that it would if it were more open. There is little dispute that one of the reasons Portland is the country's best beer town is because we have such a vibrant pub culture. It creates a community of beer drinkers whose appreciation grows geometrically, rather than in bottle-by-bottle increments. Although I haven't run the data, I suspect a strong correlation exists between density of pubs and craft beer sales. Maybe it's just a matter of being an Oregonian, where local is best. Pub closures have soared to a record high – 36 a week – as drinkers choose to buy cut-price alcohol for consumption at home. The British Beer and Pub Association said 936 pubs ceased trading in the first six months of 2008. Pubs are shutting nine times faster than in 2006 and 18 times faster than in 2005. The BBPA fears closures will gather pace, with the imposition of above-inflation rises in beer duty. Almost 2,000 pubs are expected to close by the end of the year. "There will be many thousands of closures – probably 6,000 in the next three or four years," warned Mark Brumby, a City analyst with Blue Oar Securities. The reason, according to British beer writer Roger Protz, is supermarket discounts. His just-released Good Beer Guide suggests that they're actually selling beer at a loss to get new shoppers. "When a pub closes the community's heart is ripped out and dies," Protz said. "It's a particular problem in rural areas, where the village pub is the heart of the community. People go to pubs for friendship, conversation, to enjoy an affordable meal, or just quietly read a newspaper." More than 70 new small brewers have opened in the past year, according to 2009 Camra Good Beer Guide published today. Such is the proliferation that the UK now has 550 breweries – more than at any point since 1945. And while lager sales are falling, with a 10 per cent plunge for the leading lager Stella Artois, bitter ale brewed by members of the Society of Independent Brewers (SIBA) rose 11 per cent in 2007. So maybe things are just coming into equilibrium, as British beer drinkers trade in their Foster's and pick up some tasty draft cask. A day before that movie opened in 1993, Cano announced that he had extracted DNA from an ancient Lebanese weevil entombed in amber, just as the fictional employees of InGen do with a mosquito to create their dino-amusement park. One newspaper account said the "achievement" refuted "the long-held view of many biologists that DNA of so great an age" couldn't be preserved. Of the science behind the suds, Cano says, "It's just like the Rip Van Winkle effect. What they are doing, they are remaining dormant -- the bacteria or the yeast and generally spores of some sort -- and then when you take them out of the amber, they reawaken and continue to reproduce. So they are alive." Ultimately, he managed to culture the yeast and has actually brewed beer with it. 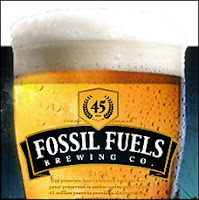 The result is Fossil Fuels Brewing Co., which ferments a yeast strain Cano found in a piece of Burmese amber dating from about 25 million to 45 million years ago. The company -- in which Cano is a partner, along with another scientist and a lawyer -- introduced its pale ale and German wheat beer with a party last month at one of the two Bay Area pubs where Fossil Fuels is made and served. "I was impressed with the flavor that the yeast brought out," said Orvil Kirby, a patron who tried the wheat beer at Kelley Bros. Brewery, where it's made. "My first taste of it, I thought they might've added some cloves to the beer." Unfortunately, you have to go to California to try it. Maybe the folks from Belmont Station will agree to take a road trip. The group filed a federal lawsuit Wednesday claiming Belgium-based InBev’s $52 billion purchase of Anheuser-Busch Cos. Inc. would violate U.S. antitrust law if completed as planned in the coming months. The suit, filed in Anheuser-Busch’s hometown of St. Louis, does not seek financical damages but asks a judge to block the deal. The Department of Justice often reviews large acquisitions to determine if they are legal under U.S. law. But attorneys behind the lawsuit said they want to halt the deal regardless of the verdict in Washington. A doomed venture, but as someone who regularly signs on for doomed ventures, this beguiles. The suit filed Tuesday challenges the deal’s legality on different grounds. It says the merged brewery, to be called Anheuser-Busch InBev, would have a monopoly over beer production in the United States. The lawsuit argues that combining two of the world’s biggest breweries will reduce competition. “If InBev is allowed to purchase Anheuser-Busch, there no longer would be any significant major potential competitor to influence pricing and marketing practices in the United States.” the suit says. I got caught up with another project. Anyone hear how Ron Gansberg's tasting went? I will have to wheedle and beg for a private tasting. For those who are not familiar with the Raccoon Lodge or brewer Ron Gansberg's ouvre, I can direct you to my post from February, "Brussels on the West Side." Oh, and what the hell, here's my video of that visit. I will confess at the outset that until bottles of Silver Moon's beer appeared at Belmont Station, I didn't know it existed. This is a great oversight, particularly given that the brewery's eight years old. Oy. In my defense, they only brewed 1000 barrels last year--all draft--so apparently distribution has been limited. The brewery started bottling earlier this year, and you can now track down 22s in Portland. Hours: 10-6 Mon -Fri, 10-5 Sat. Silver Moon recently relocated to downtown Bend, where they have a pub featuring live music on Wednesdays and Saturdays as well as pool and a game room. They brew five regular beers: Hound's Tooth Amber, Snake Bite Porter, Bridge Creek Pilsner, Badlands Bitter and the Hob Knob IPA. The porter, amber, and hefeweizen are available at Belmont Station. I picked up a couple bottles of Silver Moon's beers this week (reviews to come), one of which is brewed in the dreaded "amber" style. I will confess to a certain weariness as I poured it out, because I'm almost never pleased with ambers.... Ambers seem to have been aimed at people for whom color is about as much information as they need. They are approachable, and their sweetness is enhanced by Cascade hopping, which make them a bit like lemonade. Add some body and you've got a crowd-pleaser, if not a great beer. Folks, things have been getting a little heated on the comment threads the last few days. A blogger named Doc. Wort has been a mostly-supportive critic of mine for a couple years, but he has a sharp tongue. On the Dissident thread, he called me out for being ignorant of beer styles, and this created some blowback from readers. On his own site, he wrote a post castigating "hack bloggers," and although he doesn't name names, it seems pretty clear where his ire is directed. I don't actually mind Doc Wort's provocations. He's a regular commenter and regular reader, and since I have so few, I feel thankful to all of you. Even more importantly, he's a good-beer lover, and any good-beer lover is a friend of mine. I blog because I love Oregon's beer and because this interactive medium creates something of a community. If you have an authentic community, disagreement is the price of admission. But at the end of the day (last call? ), we are all brothers and sisters before the cask. So cut Doc Wort a break. As for some of the charges he makes in that post, I would like to add that all opinions expressed on this blog are mine alone. I receive no payment for these opinions, no ad money from breweries (or anywhere else), and no free beer. I do sometimes get in on a junket to a brewery or fest wherein I get a free taster here or there. (I'll be on one tomorrow when I go to a media event at Cascade Brewing/Rac Lodge.) But these are standard for the industry and I think reasonable people can see they hardly constitute enough of an incentive for lily-gilding. The biases expressed herein are not purchased, they're all mine. Let's all relax and have a craft brew, whatsay? I believe I'll do very little today, culminating with a trip to my favorite local watering hole at four to watch my Pack dismember the vaunted Vikes. Nothing accompanies a locally-brewed IPA so well as three hours of Packertainment. Update. That Rodgers kid is all right. Economists David Blake and Angelika Nied found in 1997 that beer consumption, unlike other categories of alcoholic beverages, increases with unemployment in the United Kingdom. The study also showed that beer is "income inelastic" -- that is, less income does not translate into spending less on beer. At supermarkets and convenience stores, Nielsen research shows, sales of craft and "superpremium" beers such as Michelob and Rolling Rock have jumped by double digits this year. Hat tip to Maureen Ogle, who was quoted in the article. Review - Deschutes "The Dissident"
Why "the Dissident?" Is Deschutes serving notice that they are now taking up a most unusual career of brewing exotic beers? If so, it is not because they have been cast out--no brewery has boasted more success of late than the boys from Bend--but because they are casting themselves out. The label suggests something of mid-century rebellion, with its spareness, the rising crow. It could be a handbill to a Sartre play. But enemy of society? Not with this beer. The Dissident is brewed to the style of a Flanders brown, and in the "provision" strength of Goudenband. 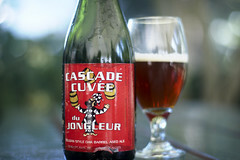 To a pretty large beer, Deschutes added candi sugar and Montmorency cherries, resulting in a beer of 8.8% alcohol. It starts out with a sour mash (I think), and two varieties of brettanomyces are used (Bruxellensis and lambicus) as well as a lactobacillus culture. (That's a lotta funk.) Finally, 20% is aged in pinot/cab oak barrels. The entire batch has been aged 18 months. As you can see from the picture, it's a bright brown, with reddish highlights. The aroma is not as funky as Liefman's--there's none of that skanky brett, but rather a sweet chocolate and sour cherry-accented nose. As it opened up, the astringency of the sour diminished a little and the cherries muscled their way in. It is a lovely and approachable beer. I find the three major notes of the beer come together in very nice harmony. The body is creamy and rich, with malt notes contributing a brown sugar/biscuit base. Onto this are balanced the twin flavors of tart/sweet cherries and the sourness of the yeast and cultures. The strength of the beer helps bring the flavors together, and I imagine the age is a huge help, too--though alcohol is not a major flavor note. The result is a beer that is neither heavy nor overly sour. It's inviting enough that you could swill a fair quantity before realizing what a whollop it packs. It is a triumph of a beer. The brewery clearly put a huge amount of thought into this beer, not to mention time and money. None of that guarantees success, though. Yet I found The Dissident to be the measure of an authentic oud bruin in every way. The style is a very high bar to clear; in fact, I don't know of any American brewery to even try an authentic Liefmans-style old bruin. But Deschutes has cleared it, and the bar didn't even wiggle. A great beer and a very impressive effort. Let's hope this isn't the last batch we see of the Dissident. Availability: Extremely limited. 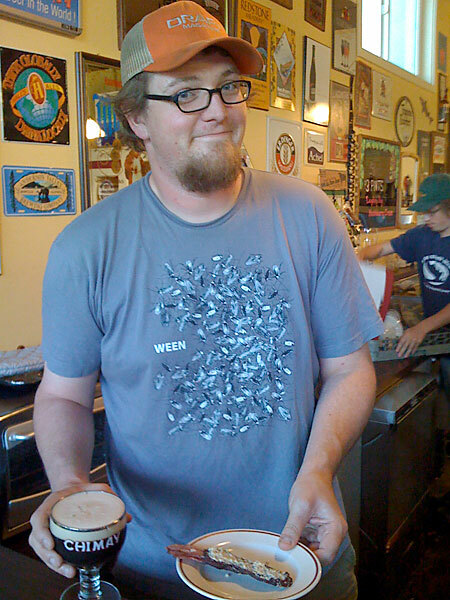 As I write this (9/5/08), you can get some at the breweries in Bend and Portland. Don't delay, supplies won't last long. Update: The good news is that The Dissident is still available at the brewery in Portland. The bad news? There's one fewer case. Update 2: I forgot to include the sour-o-meter reading for the Dissident. Call it a three. In the past few weeks, we've seen the emergence of a wonderful trend in brewing: sour Belgian ales. This is the latest stage in an evolution that has taken us from witbiers to tripels to strong goldens (last year's trendy beer). The sour barrier was breached long ago (the mid-90s saw New Glarus's Belgian Red), but it remained an incredibly obscure tributary in the currents of American brewing. But in the past year, we have seen at least a half dozen acclaimed sour beers brewed or debut in Beervana: Cascade/Raccoon Lodge's line-up of many sour ales, Double Mountain Kriek, Russian River Supplication, Walking Man Blootvoeste Bruin, BridgePortStumptown Tart, and now Deschutes Dissident. But not all sour Belgians are made the same. Their are of course the spontaneously-fermented lambic family, but also these two beers that are hard to distinguish--browns and reds. It doesn't help that there's no consistent method of naming. You hear "Flanders" or "Flemish" used interchangeably as modifiers, and "brown" and "red" used inconsistently. Generally speaking, browns are referred to as either "oud bruins" or Flanders browns (except Liefmans, the standard, which refers to itself, contra world opinion, as a "Flemish brown"). Reds are generally referred to as Flemish reds. (In a separate post, I will review Dissident, but it's useful to situate it in a style. 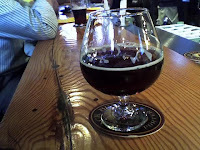 Deschutes has brewed a beer very much in the classic brown style, something of a cross between Liefmans' Goudenband and Kriek--reviewed below). Things become a little clearer when you start looking at the world standards which define the style. In the case of browns, Liefmans pretty much has the the field to themselves. Reds comprise a broader field, but they are dominated by Rodenbach. Although both styles have many similarities (color, a balance of sweet and sour, strength and age), when you compare Rodenbach and Liefmans, you see some obvious differences. Reds - the sourness here is acidic and tart. It is a clarion sour that cuts through other flavors. While these beers aren't without sweetness, it is the sweetness of wine--subservient to the balancing acid. Rodenbach, in fact, used to advertise itself with the phrase "It's wine." The body is thinner than browns, befitting a beer known as the "burgundy of Belgium." Browns - The sour here is balanced by a heartier, maltier sweetness. Brown ales are thicker and sweeter, more like desert than a wine. They have a creaminess that is accentuated by flavors like caramel, dark fruit, nuts, chocolate. While the sour note may be aggressive, the sweeter, heavier body makes the beer more approachable than red ales, which are a leaner, more spare beverage. The brewery at Liefmans has been around since 1679. The Liefmans family operated it from 1770 to 1905. Through most of the century, it labored on as a small, antiquated brewery, but was acquired by Riva in the 1990s. 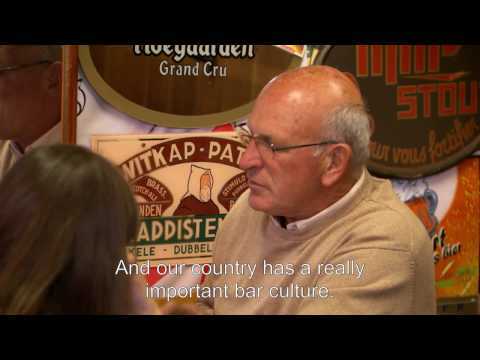 It was bankrupt by 2007, and the world was close to losing a world classic--fortunately, the independent company Moortgat (brewer of Duvel) bought it earlier this year, and apparently, all is a go. The aroma is among the most distinct in the world--man, is it complex. You pick up a lot of the astringent brett notes in the chilled version. They are funky to the point you wonder if it's off, but as the beer warms, sweet chocolate and raisins. The funkiness becomes vinegar. Of all the sour beers, Leifmans alone has an aroma of age--Jackson calls it sherry, but it seems more like tawny port to me. Age and sweetness, yes, like port wine. The flavor is simultaneously aggressively sour (I'm going to have to change the sour-o-meter--I hadn't recalled it being this sour) and comfortingly sweet. It is a thick beer, and meaty, not just in density but flavor, with a juicy, savory (salty?--yes, see below) quality. Alcohol is present, accentuating the port quality, and there are nuts and chocolate in the finish. Also, a distinct cherry note, but where does this come from? They make a kriek, but Goudenband Jackson mentions that the water used to brew Liefmans is high in sodium bicarbonate, lending a fluffy body. The body is near froth at all times, but even more, the bicarbonate may contribute a drying (and salty) quality in what is otherwise a very chocolately, long finish. The Flemish word for cherries confuses the beer world--a kriek lambic is substantially different from Liefmans, made with the brown ale base. Liefmans Kriek pours orange/red, like an autumn maple leaf. The head is pinkish-white, and the nose is cherry with a cellar astringency. An approachable beer, with the cherries out front. They create a major sweet note. The sour is less pronounced, perhaps because unlike the provision Goudenband (8%), this is a smaller 6%. The sour is on the tart side--not so much of the funkier brett you find in Goudenband. Underneath the cherries are a resonant rooty (barklike) bitterness. The effect it produces is a cherry-chocolate creaminess. 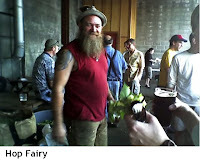 Lupulin was awarded the coveted 2007 "Satori Award" by beer aficionado/blogger Jeff Alworth. 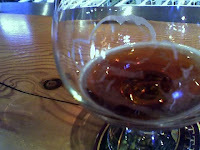 (http://Beervana.blogspot.com) Alworth writes, "In Zen Buddhism, satori is the moment of sudden enlightenment when the mind realizes its own true nature. The Satori award honors the beer that in a single instant allows the drinker to realize the true nature of beer." Full Sail invites you to experience the nature of this year's Lupulin when the brewery will tap the new batch at their Tasting Room and Pub in Hood River, and at their Riverplace Brewery in Portland, on Wednesday, September 10th at 5:00PM. For more information contact the Full Sail Tasting Room and Pub at 541-386-2247 or Full Sail at Riverplace at 503-222-5343. Cool! There is one change, though. This year's Lupulin isn't hopped with Amarillo, which provkes a slight look of trepidation on the face of the blogger. Instead, John Harris is using a troika of Mt Rainier, Cascade, and Nugget hops. (The rest of the recipe is the same.) I remain somewhat anxious, though the inclusion of the new strain of Mount Rainiers does pique my interest. They are purported to be similar to Hallertau, a classic variety. Folks, the arrival of Dissident creates a great opportunity to discuss the sour ales of Flanders, those not-really-brown oud bruins and the not-totally-red sour reds. In comments to the thread below, Anónimo raises some interesting questions and points out the growing number of American breweries tinkering with these old styles: Walking Man, Cascade, Russian River (not to mention Double Mountain and New Belgium). 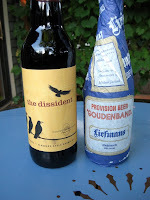 So, I will have reviews of the Dissident along with Liefmans, which is the classic of the style, as well as a general primer on what distinguishes these beers. Flanders Brown (Liefmans) - "The classic style, with an interplay of caramel-like malty sweetness and a sourness gained in several months of maturation (usually in metal tanks), is sometimes identified as Oud Bruin. The most complex examples have a secondary fermentation in the bottle. The most famous producing town is Oudenaarde (also known for Gothic architecture and Gobelin tapestries), not far from Ghent, in East Flanders. Oudenaarde's water, low in calcium and high in sodium carbonate, gives a particularly textured character to the beers." Flemish Red (Rodenbach) - "They are more sharply acidic, leaner, more reddish, half-brothers to the Brown Beers of East Flanders, with the additional difference that they are often filtered and pasteurised. Their sharpness makes them perhaps the most quenching beers in the world, and their acidity renders them very food-friendly. The sharp acidity, and some of the colour, derives from aging in large, fixed, wooden tuns." In the mean time, don't miss the chance to try Dissident--on tap or bottled--for I fear the chance is fleeting. Update. As DA Beers noted in comments below, the Dissident is available at the brewery in the Pearl. They have a limited number of bottles left--only a few dozen cases made it to the brewery, and someone came in today and bought a bunch of it. As you can see in the third picture below [whoops, forgot to put in the pics--I'll do it with the review--ed. ], everyone was drinking it, too. But you're wondering: is it worth going to the pub for? Is it worth $10 a bottle? I'll have a full review later on, but the short answer is this: it's one of the most authentic Belgian-style, American-brewed ales I've tried, and the only credible sour brown. In other words, run, don't walk. A few months ago, Dave (who is precipitously close to being downgraded to "sporadic" in the blogroll) got the ball rolling on the Growler Index. At It's Pub Night, Bill has now converted these data into a handy map, so you can run a cross tab on the GPI/MPG ratio and calculate where your cheapest growler can be found. But the info doesn't stop there! Bill also converts the price you're paying for a growler into the equivalent for a six-pack so you can see what kind of deal you're getting. It's a mesmerizing tool, so beware its seductive power. For my part, I'd like to popularize the Growler Price Index GPI, or the average price per growler in Portland. Based on Dave's numbers from earlier this year, the current GPI is $9.95. Your over/under can be calculated here, too. Single-digit growlers put you on the cheap side; when you start getting into the double digits, you're paying a premium, even on growler prices.